May 2, 1998 NOMC dedication ceremony at LSU Health Sciences Center, 2020 Gravier St., featuring keynote speaker US Senator John Breaux and music by the Algiers Brass Band. Dedicated on May 2, 1998, the New Orleans Musicians’ Clinic (NOMC) became the first such health initiative in the United States, addressing the health care needs of musicians and artists, as well as their families, whether they are insured, under insured or uninsured. Not only do we strive to affect an agenda of wellness in our musician patient population, we encourage our musicians to become advocates for early detection, prevention, and treatment for others facing the same risks. (above) NOMC Medical Director Dr. Cathi Fontenot, LSUHSC Department of Comprehensive Medicine, counsels New Orleans R&B legend Ernie K-Doe and wife Antoinette about his alcohol-induced hepatitis. (below) Dr. Cathi Fontenot examines an x-ray with Carol Schwaner, FNP at the Musicians’ Clinic. As the birthplace of jazz, New Orleans has remained a cultural mecca for centuries. Local musicians are a vital resource to New Orleans in terms of its economic viability and vibrant cultural identity. Performers entertain close to 10 million visitors each year. Yet even before Hurricane Katrina devastated the city in 2005 many musicians already suffered perpetual economic hardship and poor health as a result of limited access to affordable health care and lifestyle. In fact, the story of New Orleans musicians has too often been one of tragic, premature death from preventable causes (take for example Buddy Bolden and James Booker). This illustrates problems that many US musicians face: poor health-seeking behaviors and a lack of access to high quality, affordable medical care. With few exceptions, New Orleans musicians are independent contractors working in a cash-based economy, never having a bank account. While the city’s tradition-bearers are celebrated the world over, at home most live hand-to-mouth, outside mainstream social and economic systems. Musicians rarely benefit from employee benefits (in particular health insurance) and the Occupational Safety and Health Administration does not regulate their working environment. They are, quite simply, a class excluded from the American health care delivery system. Partnered with the LSU Health Network, the NOMC became a local response to the challenging reality that the majority of New Orleans musicians and tradition bearers existed outside of the healthcare system. 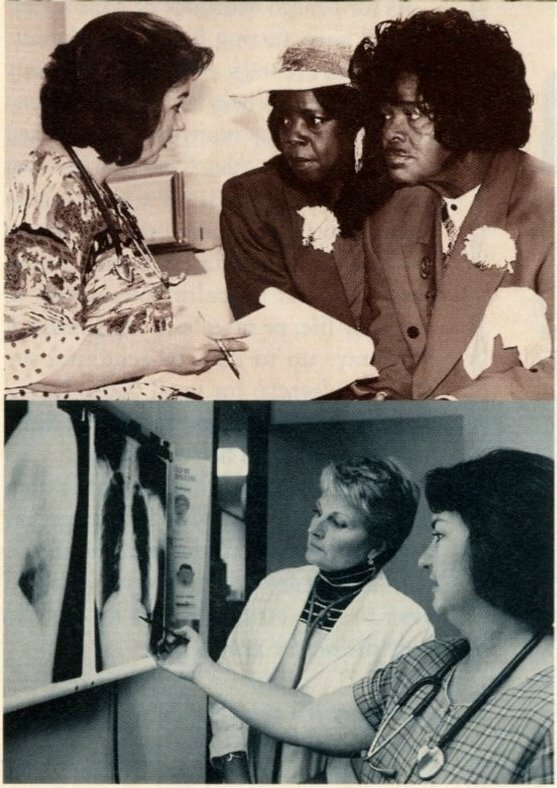 By evolving a small community clinic to provide culturally competent medical services to a unique group of New Orleans’ entertainers and performers, the NOMC was able to to evolve their patient base from a group unaccustomed to receiving routine medical care to a group who engages in preventative health and health education. Gig Fund event, 2008. The NOMAF Gig Fund partnered with local organizations to provide music for community members and more paying gigs for musicians. The New Orleans Musicians’ Assistance Foundation (NOMAF) emerged in 2005, following the devastating floods of Hurricane Katrina. As a response to the needs of NOMC patients and the local music community, NOMAF was founded as a 501(c)3 non- profit organization to support the primary care provided by the NOMC while expanding its mission to take on cultural issues, such as creating economic opportunities for musicians through its NOMAF Gig Fund (ended in 2015), raising awareness for noise-induced hearing loss during practice, onstage, at festivals and in local venues through the NOMAF Save New Orleans Sounds Program, providing a one-time benevolent payment for musicians facing extreme hardship through The NOMAF Emergency Fund, and hosting community wellness events in and around New Orleans. Dr. Jack McConnell is a physician, scientist, and humanitarian who served as corporate director of advanced technology at Johnson & Johnson. Widely acknowledged for his medical contributions, he directed the development of the TB Tine Test to detect tuberculosis, participated in the early development of the polio vaccine, supervised the discovery of Tylenol, was instrumental in developing MRIs, and helped write enabling legislation to map the genome. Following retirement, he created Volunteers in Medicine, which gives retired medical personnel a chance to volunteer at free clinics for the working uninsured and underinsured. McConnell’s visionary concept has inspired over 40 community health care clinics in less than 10 years, one of those being the New Orleans Musicians’ Clinic. McConnell became well known in the 1990s among fans of his son Page McConnell’s band Phish for his frequent stage appearances. After an inspired performance with the popular rock band Phish at the famed New Orleans Jazz & Heritage Festival, Dr. Jack McConnell familiarized himself with the New Orleans music scene and later, with the help of a coalition of local music advocates and medical professionals through the LSUHSC, set his sights on creating a “safety net” or health care resource for the musicians of New Orleans. In 1998, he founded the New Orleans Musicians’ Clinic alongside Johann and Bethany Bultman, partnered with the LSU Health Care System foundation. Dr. Susanna Connick Jamison, Harry Connick, Sr., Charlotte Connick (LSU Dental School), Dr. Cathi Fontenot, Bethany and Johann Bultman. 1999. Dr. William Jenkins of LSU Systems speaks at an NOMC dedication ceremony. (L-R) Ernie K-Doe, NO City Councilwoman Jackie Clarkson, Antoinette K-Doe and Chris Owens at an NOMC benefit. Today the New Orleans Musicians’ Clinic and Assistance Foundation is directed by Co- Founding Director & Chair Bethany E. Bultman, Co-Founder E. Johann Bultman, Medical Director Dr. Cathi Fontenot, and the LSU Healthcare Network. The NOMC has become an essential medical service due to the lack of a system of care for those without insurance. While ER and Trauma care are available, outpatient services and sick care are inaccessible in New Orleans. There remain access issues with the public hospitals in surrounding communities. For many musicians, the NOMC is their only source of support – whether it be medical, emotional, financial, or social. The New Orleans Musicians’ Clinic Staff at the LSUHCN building at 3700 St Charles. (L-R) nurse Marguerite Clark, Social Woker Megan McStravick, FNP Catherine Lasperches, and diabetic educator Felice Guimont, RN. Bethany Bultman, Co-Founding Director & Chair, outside of the NOMC at the LSU clinic at 3700 St. Charles Avenue. To learn more about the NOMC’s place in the current New Orleans health care community see us featured in the winning City Accelerator video: WATCH HERE.